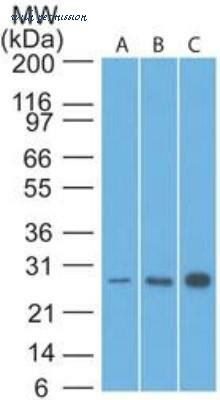 The BCL2 antibody from Proteintech is a rabbit polyclonal antibody to a recombinant protein of human BCL2. This antibody recognizes human, mouse, rat antigen. 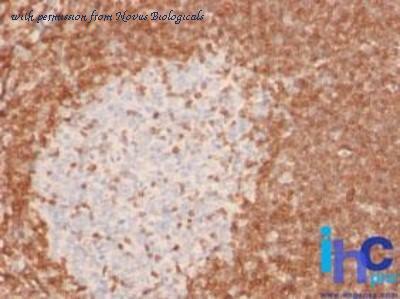 The BCL2 antibody has been validated for the following applications: ELISA, FC, IHC, IP, WB analysis. 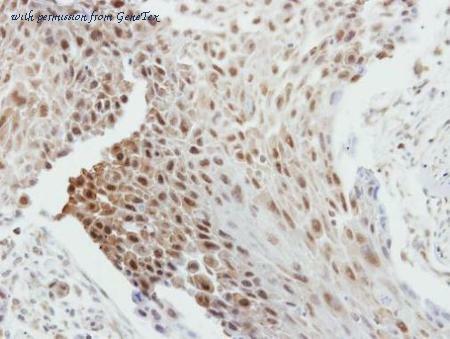 Immunohistochemical analysis of paraffin-embedded Breast ca, using Bcl-2(GTX100064) antibody at 1:250 dilution. Flow cytometric analysis of mouse splenocytes tissue using Bcl2 antibody. Western blot analysis of mouse embryo lysates using Bcl2 antibody. Immunohistochemical staining of Mouse brain tissue using Bcl2 antibody. 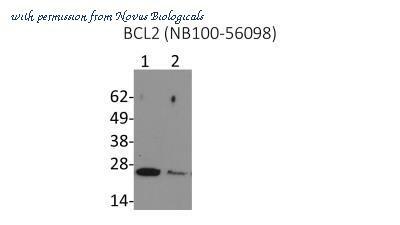 Western Blot: Bcl-2 Antibody [NB100-56101] - Analysis of Bcl-2 in 293T cell lysate (30ug) using anti-Bcl-2 antibody. Image from verified customer review. 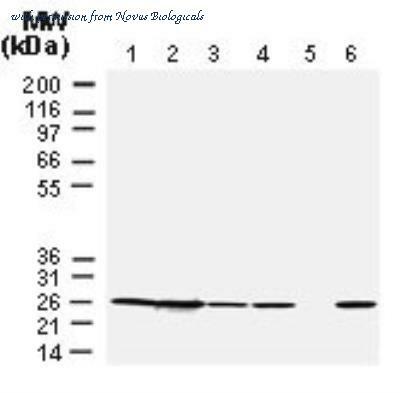 Western Blot: Bcl-2 Antibody [NB100-56098] - Analysis of Bcl-2 in whole cell lysate from Daoy cells. Cells were transfected with scrambled control siRNA (lane 1) or Bcl-2 siRNA (lane2). Image from verified customer review. 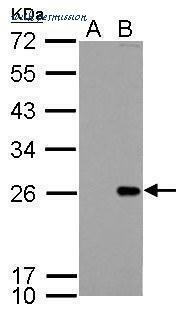 Western Blot: Bcl-2 Antibody [NB100-56098] - Analysis of Bcl-2 in 293T cell lysate (30ug) using anti-Bcl-2 antibody. Image from verified customer review. 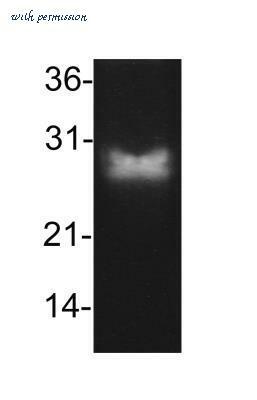 Western Blot: Bcl-2 Antibody [NB100-56098] - Analysis of Bcl-2 using this antibody at 1:2000, 20 ug/protein was loaded per lane. Lane 1. Human Jurkat T cells. Lane 2. Human RS11 lymphoma cells. Lanes 3-6. Human breast cancer cases. Patient sample in lane 5 lacked detectible Bcl-2 expression. 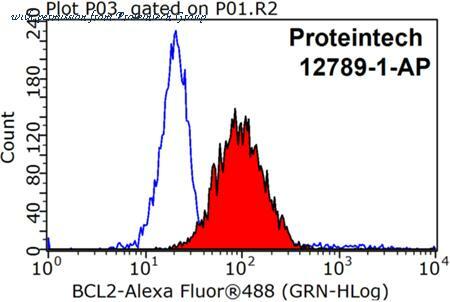 Flow Cytometry: Bcl-2 Antibody (8C8) [NBP2-29630] - Analysis using the HRP conjugate of NBP2-29630. Detection of Bcl-2 in 293T cell lsyate (30ug) using anti-Bcl-2 antibody conjugated with HRP. Image from verified customer review. Immunohistochemistry-Paraffin: Bcl-2 Antibody (8C8) [NBP2-29630] - Formalin-fixed, paraffin-embedded human tonsil stained with Bcl-2 antibody (1:200), peroxidase-conjugate and DAB chromogen. Note cell membrane and cytoplasmic staining. Staining of formalin-fixed tissues REQUIRES boiling tissue sections in 1mM EDTA, pH 8.0 for 10-20 min followed by cooling at RT for 20 min. Epitope unmasking in EDTA (compared to Citrate buffer) is superior. 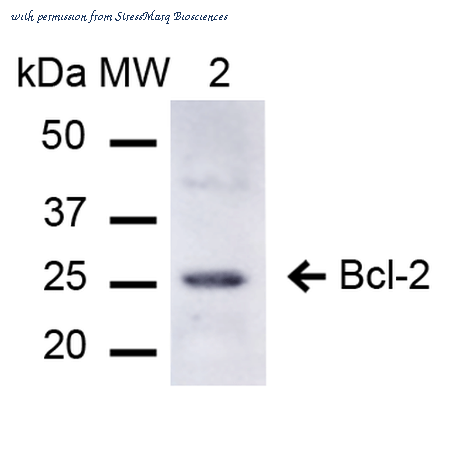 Western Blot: Bcl-2 Antibody (8C8) [NBP2-29630] - Analysis of Bcl-2 in human A) HeLa, B) A549 and C) MCF7 lysate using Bcl-2 antibody at 2 ug/ml. Western blot analysis of Jurkat (1), Raji (2), WR19L (3), and PC12 (4) cell lysates , probed with Bcl-2 mAb (83-8B). Detection of Human, Mouse, and Rat Bcl-2 by Western Blot. Western blot shows lysates of THP-1 human acute monocytic leukemia cell line, KG-1 human acute myelogenous leukemia cell line, CTLL-2 mouse cytotoxic T cell line, and NRK rat normal kidney cell line. PVDF Membrane was probed with 0.1 ╡g/mL of Mouse Anti-Human/Mouse/Rat Bcl-2 Monoclonal Antibody (Catalog # MAB8272) followed by HRP-conjugated Anti-Mouse IgG Secondary Antibody (Catalog # HAF007 ). A specific band was detected for Bcl-2 at approximately 24 kDa (as indicated). This experiment was conducted under reducing conditions and using Immunoblot Buffer Group 1 . 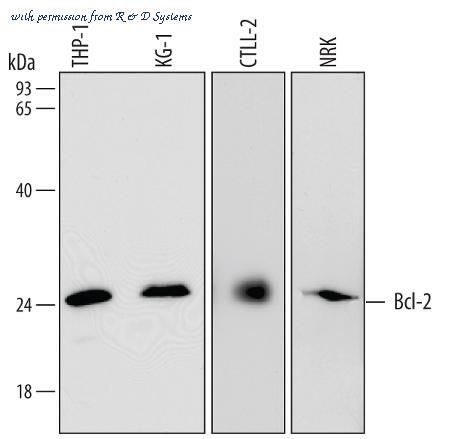 Western blot analysis of Human Embryonic kidney epithelial cell line (HEK293T) lysate showing detection of ~26.3 kDa Bcl-2 protein using Rabbit Anti-Bcl-2 Polyclonal Antibody (SPC-655). Lane 1: Molecular Weight Ladder (MW). Lane 2: 293Trap cell lysates. Load: 15 µg. Block: 5% Skim Milk in 1X TBST. Primary Antibody: Rabbit Anti-Bcl-2 Polyclonal Antibody (SPC-655) at 1:1000 for 2 hours at RT. 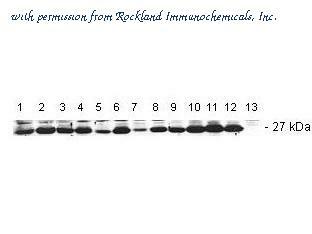 Secondary Antibody: Goat Anti-Rabbit IgG: HRP at 1:1000 for 60 min at RT. Color Development: ECL solution for 6 min in RT. Predicted/Observed Size: ~26.3 kDa. Anti-Bcl-2 is shown to detect Bcl-2 in GP-E86 cell whole cell lysates. Lanes 1 -10 and 12 are bcl-2 mutants. Lane 11 is wt bcl-2. Lane 13 is an empty vector lysate. Detection occurs using a 1:1,000 dilution of antibody followed by 1:4,000 dilution of HRP Goat-a-Rabbit with visualization via ECL. Film exposure approximately 1’. Other detection systems will yield similar results.